Tonight I did something totally awesome. I wasted an hour. Just totally, utterly wasted it. It was beautiful. Paige went to bed early, and I had this strange (although not unusual) urge to go shopping! 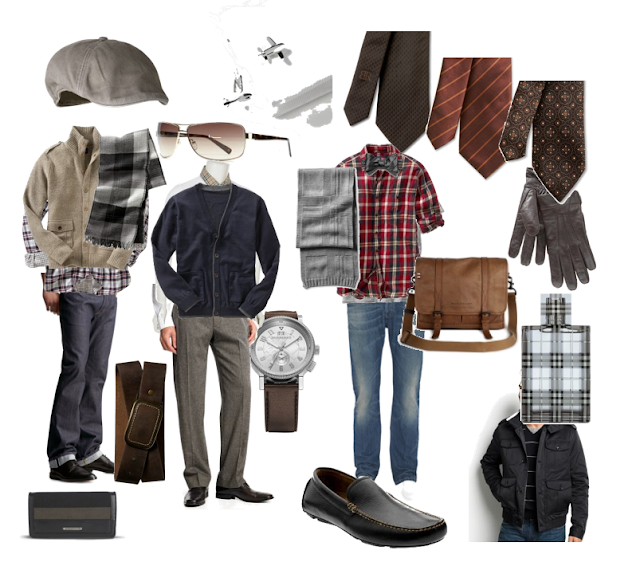 So I logged into Polyvore, and picked out all sort of Christmas presents for my husband that I can't afford to buy. :o) I've been encouraging him to update his wardrobe from jeans and t-shirts for a long time. He calls it by another name(Prov. 21:9), but come on: he's had the same coat since 9th. grade. 9th grade!! You have to admire that man's contentment. Anyway, here are the delicious and slightly ostentatious things I picked out for him. They came from everywhere, from Gap, to Banana Republic, to J.Crew, to Burberry. In all reality, we're not really getting each other Christmas presents this year, which is just fine with me! We got Paige something, and we're going to have graham cracker pancakes for breakfast. What else could I possibly ask for? Take care everyone, I hope your last few days of anticipation are holly and jolly! Graham Cracker Pancakes?!?! I want to hear more about those! Asians. My mom is Filipino and also about 5 ft tall haha. There are even shoes that look great on her that wouldnt on others. And...I totally appreciate you posting my hat that I made (your idea) on your blog. I kept seeing traffic from your blog to mine, and I kept wondering why. I hope that I get back to regular posting after Christmas. Thanks again...you're so amazing! I can identify - My hubby has worn the same winter sweater for 17 years! I like what you picked for him. I had to go look that chapter up, so good to stop and read. Esp. v 30 ~ Human plans, no matter how wise or well advised, cannot stand against the LORD.~ so grounding! Thanks for the laugh, you had me for a minute. I often shop for my husband in my head. I hope you have a very blessed Christmas! Haha, that is great! I have a similar struggle with my hubby. In our 6+ yrs of marriage he has conceded a few things, but man what I wouldn't give to make over his wardrobe. Oh I wish I could get rid of my husband's entire wardrobe and start over! Jeans and tee's every day. I think you did a good job dreaming up a new look for your husband and I think it would look great on my red-headed one as well! We aren't buying gifts for each other either, just the girls. We bought our first home this year, so that covered all the holidays for '09! It is more than enough for your husband and Paige^^, isn't it? I also enjoy visiting your blog everymorning. You inspire me!! LOL! Did a double take there - very cute! I too want to hear about graham cracker pancakes! I just sent my daughter a link to Polyvore with a note saying "you must limit your time". too funny.I can relate. My hubs has the same pair of ratty old leather slip-ons from when he was 15! and his wardrobe consists of nothing more than jeans and t-shirts that have silly things written on them. I try to get him to buy nice things, but says it makes him feel"stuffy".He does have a nice pair of Gap jeans that he wore for our Wedding, that havn't been worn since.But I dont think he'd mind one of those cars you dream of! !And we dont buy for eachother either, its much nicer to just see the kids open theirs and how happy they are, thats my gift. Graham cracker pancakes! Where can I get this recipe? That's the kind of shopping I do. I'm making several gifts this year, one for the baby, one for Emily and one for my husband. I made the baby a sock doll. Emily a night gown and I'm going to do a painting for my husband. I'll have pics of these on my blog after Christmas sometime. You'll adore the night gown because it has ruffles. I'm also going to download the new Chris Mullins Christmas album off of I Tunes for my husband. I hope you have a blessed Christmas. By the way, I saw that Shona had commented on your blog. She is a very good friend of mine. We go to church together. I told her about you. She is an artist on call for Summerset. She has a very nice blog. It's about art, but I think you would enjoy it. Hope you have a fabulous Christmas! "(Oh, and keep in mind that he's Korean. Certain things just look cuter asians, don't they?)" TOTALLY! The fiance is Viet (and all the old exes are Asian of some sort). Overly stylized items look way better on them than most of the other guys I know. Wonder if our halfy daughter will be able to pull off the same thing? Seems like yours totally can! Hey! Just wanted to say Merry Christmas. I know the true meaning of Christmas will be filling your home and that joy will be with you all. Have a wonderful celebration! Oh too funny! My husband still wears his high school class president and golf polos out and about when he 'gets the urge'. ahh! how does he not know that it's way past those days :o)!